If you are not an athletic person, trying to fit physical education in your homeschool schedule can be a real challenge. We have joined sport teams, walked, and worked out at the local gym. Sometimes, you just want to do something different. Physical education doesn’t have to cost you much, especially when you take advantage of your local park. 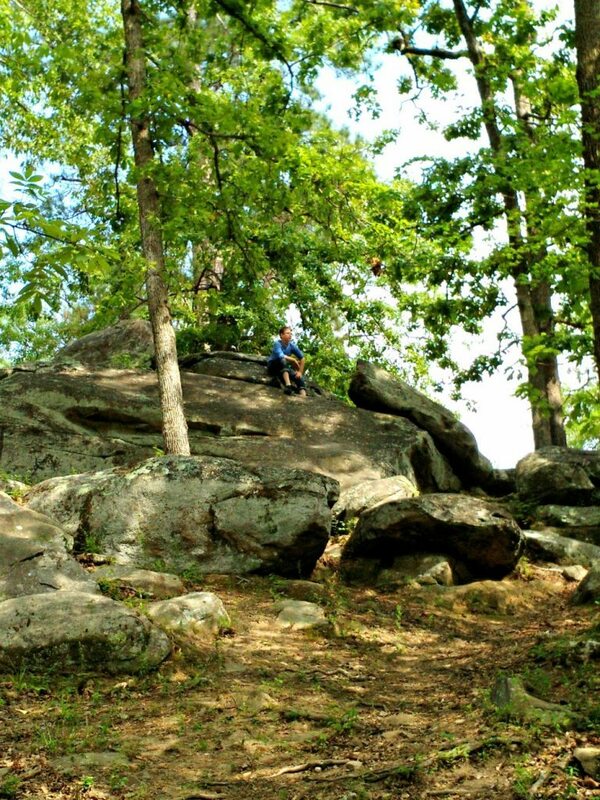 State parks seem to offer the most opportunities and not all offer the same amenities. 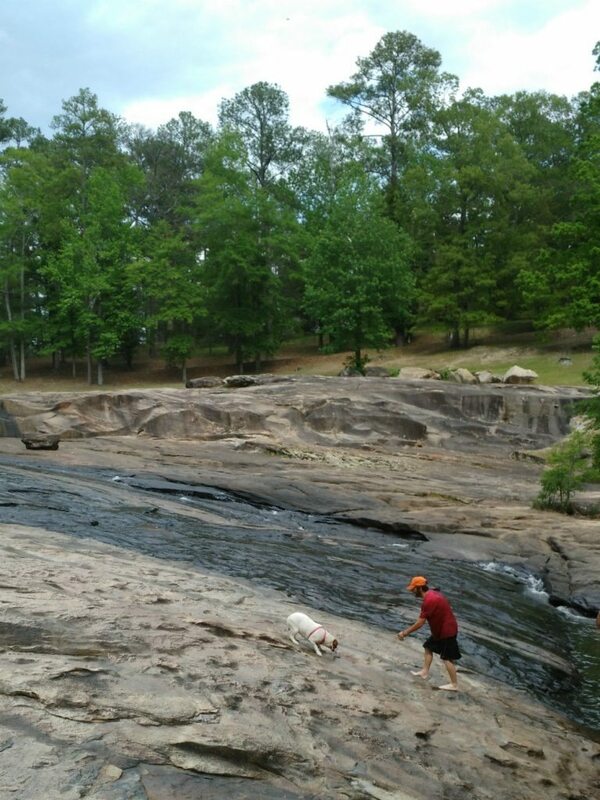 We recently moved to Georgia and we are having so much fun exploring the state. This month, we are focusing on visiting parks. I have found several activities that we can do that I count as physical education. The best part? The kids don’t even realize we are still doing “school”. Walking is probably the most obvious choice of exercise at a park. What is really great about walking in a park is that it’s usually not just walking around a track. We have found interesting nature trails to follow where we have been able to discover native plants and watch animals in their natural habitat. If your park has some great nature trails, remember to take along a sketchbook. Bike trails are another obvious choice but if you can find mountain bike trails, you can really challenge yourself. 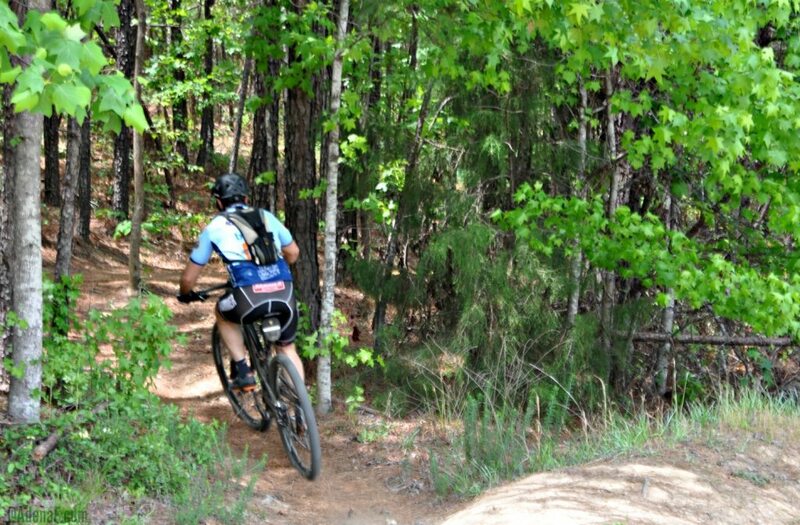 We have located a wonderful paved trail that runs alongside the Chattahoochee River. It’s a great path for distance and is right at my fitness level since it’s relatively flat. Once we increase our skill and stamina, there’s a park near us that has nine miles of trails winding through woods and grassy fields, complete with a view of a waterfall. As your ability increases, you can easily find new trails to explore. 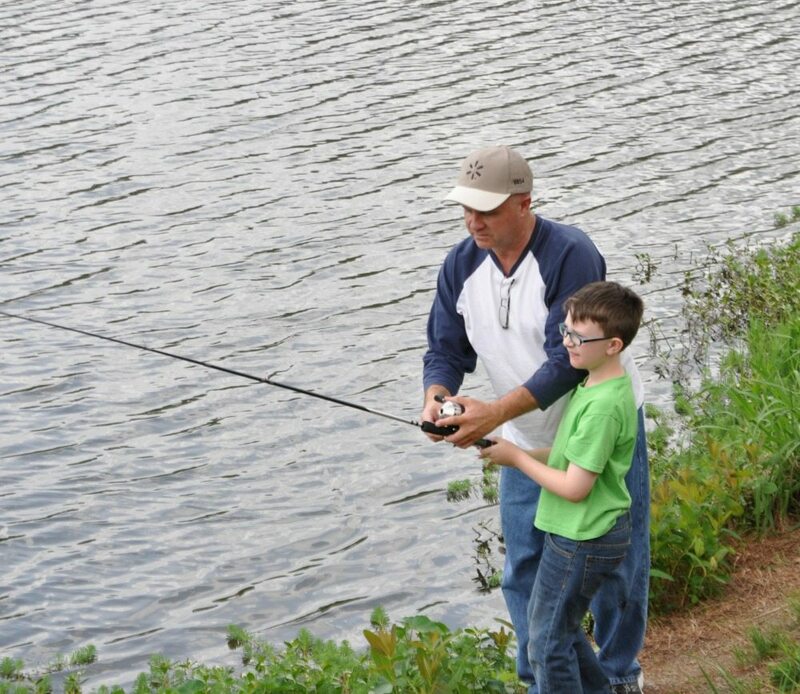 It is true that you might not break a sweat when you fish, but I still believe you can count it toward physical education. At least, I hope. We always do catch and release (I can’t even take the fish off the hook, much less clean it to cook it!). It is easy to include some science whenever you fish so it’s like you get two for one. 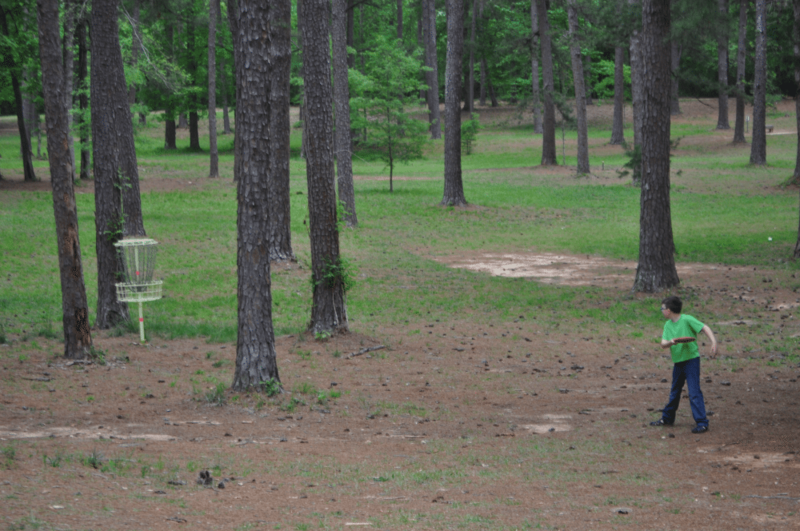 If you have never tried your hand at disc golf, you are missing out on some serious fun. It’s fun even when you do not perform well. Disc golf is basically throwing a frisbee (called a “flying disc”) into a net. Just as in golf where you have to choose the correct club, you need to choose the correct disc depending on course and distance. The biggest challenge might be in finding a course. Most large parks either have a pool or a lake that allows swimming. We found an area in one of our local parks where we could slide down rocks into a water hole. I know it’s going to be a very popular spot when school is out and the sun is blaring hot. You will have to check pool schedules and plan your swim around swimming lessons. Depending on how many you have in your group, you might be able to arrange a ball game or play ultimate Frisbee. If you don’t have any willing participants, there’s always the playground. Explore your local parks and you will find each one offers its own unique opportunities for physical education. Don’t be afraid to think outside of the box and get outside. Homeschooling can be intimidating. Homeschooling high school can be really intimidating. But it doesn’t have to be. Whether you have homeschooled from the beginning or just starting, there are a few things you should know before you make the decision to homeschool your high school student. It is best to decide ahead of time what your student’s future plans will be. If they will be attending a university, their courses will be different than if they plan to do an apprenticeship or go to a vocational school. If future plans are still undecided, it is best to go ahead and plan for a more challenging course load from the beginning. First, you need to know your state’s graduation requirements. Next, check a few colleges to see the minimum courses required. Now you are able to make a loose plan of core courses to satisfy those requirements. When planning high school, plan all four years at once. There will always be wiggle room, especially for electives, but the essentials will be planned. What records you keep prior to high school depends on your state’s or your umbrella school’s requirements. Many do not require anything more than an attendance record. Some might require a list of classes taken and standardized testing results. However, when it comes to high school, you should document much more. Not only is this important if it’s needed for a college interview, but it also makes great memorabilia. Colleges look at more than just courses so be sure to include any other achievements, clubs, hobbies, volunteer activities and anything else that showcases your student. There are two ways to record all of this — transcripts and portfolios. Transcripts will show all of the academic courses taken, grades and overall GPA. It is also a good idea to include relevant test scores. Course descriptions can be on a separate page but is ideal for homeschoolers, especially since many electives that homeschoolers might take are not offered in a public school setting. Portfolios are more like scrapbooks. You should include photos, newspaper clippings, ribbons, certificate of achievements, etc. A portfolio will portray your student as a whole individual, more than just an academic reflection. The true beauty of homeschooling is that your student can learn what they really want to learn. They do not have to be forced into the typical learning mold but rather have a learning experience that is customized to their interests. There is so much freedom, especially when deciding on electives. Think outside of the box. You are not limited to a small selection of courses. You can look to others to teach what you don’t know. There are tons of online courses and/or professionals that you might know that would be willing to help your student. Yes, homeschooling high school might be intimidating but it is so rewarding. You can equip your student with everything they need for their next chapter of life, regardless of what that will be for them. Most importantly, during this time you can teach them the important things that never make it on to a transcript like work ethic, honesty, integrity and more. Use this time to build a solid foundation in your relationship. After your student graduates high school, your personal relationship will change. Plant the seeds now so that your future relationship can blossom. Most importantly, enjoy the journey. Moving from one home to another can be an overwhelming venture, especially if you are moving to another state. If you are attempting a move while homeschooling, it can be even more difficult. One of the best ways to make the transition easier is to involve your kids. This often includes adjusting your studies to work around the move. We are currently moving from Florida to Georgia. Not only did this move happen suddenly and in the middle of our school year, but it also happened during the holidays. I had to change my expectations of what was going to be accomplished in our school and also figure out how to get the boys excited about the move. The upside to our move was that it doubled as authentic American geography! This is how I used our move as the basis of some geography lessons. I’m Reading about Georgia by Carole Marsh (This is one of our favorite children’s authors and she has written many mysteries that are based on famous places. Be sure to look and see if there’s one based in your own state.) This is a colorful book that lists all of the basic facts about the state. The Big Georgia Reproducible Activity Book by Carole Marsh. We have previously used Marsh’s activity books for other states so I was glad to see she had one for Georgia. Little Warrior: Boy Patriot of Georgia by Geoff Baggett. This book tells the account of a young boy living on the Georgia frontier during the Revolutionary War. There are many fun types of scavenger hunts you can take from the popular Pokemon Go to traditional letterboxing. On a broad scale, I like to first do an online scavenger hunt to learn about the entire state. Since my boys like learning about historical battles, I printed a Civil War map from WonderMaps. Since we will be living near the National Infantry Museum in Columbus, that will be one of our first field trips. I want the boys to have a general idea of what role Georgia played in the wars before we go. The boys also used the maps to see how far we will be from their grandparents and other siblings. My youngest was relieved that everyone is still within a day’s drive. The boys and I then did some internet searching to learn the best places to visit and best things to do in Georgia. Since we will be practically living on the Alabama line, we did those same searches for Alabama. Not only were we learning the special characteristics of each state, but we were making long term plans for future field trips. Last but not least, we used Yelp to search the best food spots. We especially like to see if there are any places that have been shown on the Food Network programs Man vs. Food and Diners, Drive-Ins and Dives. Becoming familiar with some of the popular sites and restaurants gave my children something to look forward to since we hope to visit all of those locations after we are settled in our new state. This research is very natural and informal. The kids don’t even realize that they are ingesting geography knowledge as we are doing it. Search for top movies set in your new state of residence. (Of course use discretion when showing movies to young children. Do your research before sitting down to view.) Although states are not always accurately portrayed in movies, the films still give us a starting point for research and/or discussion. Most of all, involve your kids and make learning about your state an adventure. Use the maps to mark national parks and then go visit them. And if you are going to be in the car for a while, don’t forget to get a state coloring book. History was one of my least favorite classes when I attended public school because it consisted only of reading a textbook full of dates and completing endless worksheets. Boring. When I decided to homeschool, I knew there had to be a better way. I knew that my main goal — to instill a love of learning in my children — could not be accomplished with rote memorization and fill-in-the blank worksheets. While I do not have a problem with textbooks in general, I do believe that you can adding extras makes learning more enjoyable. Whether you use a textbook or not, I hope that some of these ideas will encourage you to step away from traditional learning and engage in studying history in a way that will add an element of fun in your homeschool. When my daughters were younger, we incorporated the American Girl books into our studies. We experienced the Revolutionary War with Felicity and World War II with Molly. If it weren’t for these fictional girls, my own daughters would have balked at having to study about wars. After American Girl doll books, we moved onto incorporating Royal Diaries series and My America. When my boys were old enough to be included in our homeschool, they enjoyed series that showcased young boys. For a child, being able to relive a historical event through the eyes of another child, makes that time period relatable. And isn’t that what history is all about —being part of someone’s story? Historical fiction, also referred to as living books, allows you to experience history firsthand. When it comes to watching films and documentaries to enhance your history studies, you really have to take the child’s age and attention span into account. While I love a great documentary, my kids can only sit through a few minutes before they get distracted. However, as they matured, they could glean more from them and documentaries become a good addition. When they were younger though, they would beg to watch some of the films and television shows that I allowed, not even realizing that it was “school.” While you might enjoy some of these through streaming services, I usually purchase the DVDs so I know they are always available can be taken on road trips. I can’t write about how we include videos in our homeschool without mentioning You Tube. This is perfect for those with very short attention spans. It’s best to search exactly what you are looking for, and I recommend previewing each video to verify that it is suitable for your family. History Teachers is one channel we watch for the funny parody songs about famous people and time periods. It never really occurred to me to include recipes in our homeschool until we studied of the states of America. At that time, I found a cookbook with a recipe representing each state. When we moved onto world geography the following year, I searched for global recipes that represented different cultures that we studied. There are also cookbooks that focus on time periods. Did you know that they made johnny cakes were made by the early settlers and carried in their saddlebags during long journeys? My grandmother told me that rice was often mixed in with scrambled eggs to make enough to feed the entire family. American Girl Collection also has cookbooks for each of the original girls. I love to wrap up every study with a field trip if I can find one that complements what we studied: battlefields, Indian Mounds , and outdoor drama, for example. During our searching, we found a family in which all of the children died within three months of each other. After research, we learned there was a battle nearby during that time period. We discussed reasons for their death. Perhaps they died due to a shortage of food and medicine, or maybe they were killed by enemy soldiers. There are myriad ways to explore history; these ideas are merely to get you started. I haven’t even touched on making period costumes or interviewing older adults for firsthand accounts. The point is to supplement your history textbook with a variety of avenues to learn. Learning centers are a great way to include younger children in your daily homeschool routine through independent work. I have found them to be a lifesaver while my attention is needed to assist older children. Learning centers can be as simple or as elaborate as you want them. To have successful learning centers, I have found that it is best to allow the child access to the centers only at designated times. Often, I will send my son to a center with a timer set for ten minutes. The amount of time will vary from child to child. You don’t want him to lose interest by spending too much time so that there is no appeal to return the next day. Conversely you don’t want him to spend so little time that he becomes frustrated by being unable to complete an activity. I am sharing some easy, and mostly inexpensive, ways to set up five different learning centers. A learning center can be arranged on a table, on a shelf, or even in a shoe box. Fine motor skills, while important, are often overlooked. I have found that my daughters naturally had great fine motor skills because they enjoyed coloring, sewing, drawing, etc. My boys, however, did not. Other than playing with LEGOs, most of their activities involved large motor skills such as sports. Their lack became evident when it was time to learn to write. All of my boys had terrible handwriting. I discovered that making them do some simple activities every day strengthened their fine motor skills and helped them to write more neatly as they had better control over the pencil. Lacing cards You can make these with old Christmas cards and a hole punch. Use a shoe string to lace through the holes. Kitchen tongs/tweezers and items to pick up with them If you use larger items like plastic toys, building blocks, etc., then use the tongs. Tweezers are great for smaller LEGO pieces, beads, buttons, etc. You can easily combine your language arts and fine motor skills learning centers if you need to consolidate space. I have always used language arts curriculum that incorporates movement, so I don’t find that I need as many activities in my learning center. Alphabet flash cards with a rice bowl Use whatever flashcards you have on hand, but I found it especially helpful if you can obtain the ones that have directional lines teaching how to form the letter. Children draw the letters in the rice. Once they know how to form the letters, it’s easy to use tiles from any word game. Picture books If you happen have a handheld recording devices or a voice app on your smartphone, it’s cute to let your children make up their own story for wordless books. Audio books I use my local library to check out audiobooks. There are also many apps that you can download audio books. Of course, many of these might take a little longer than the time you have allowed to spend in this center, so adjust accordingly. Although math seems to be the one subject my children complain about working on, it is always one of the most popular learning centers! You can find many items to add to your math center at the local dollar store. Items to sort These can be anything from Skittles to buttons or foam building blocks to counting bears. Geoboards and tangrams These are the most popular activity in our center. Play money I have flashcards that have an amount on one side and pictures of coins that you can make that amount on the other. The child matches the coins and as he gets older, he can use the coin pictures on the back to check his work. Interlocking cubes Have your child rebuild a replica of a pattern you have already created. Our science learning center is the one center that I switch items out most often. I like to find items that tie into whatever we are learning at the time. Magazines Our favorites include Zoobooks, Ranger Rick Jr. and Your Big Backyard. Objects from nature Shells, rocks, leaves, feathers, even bugs are favorites. Animal flashcards You can find these online to print out and use as a memory game, matching pairs or matching the mature animal with its baby. Scales Digital or the balance type are fun for weighing and comparing. While the science center is changed more frequently, the social studies center changes usually twice a year. I try to have it reflect either what I am teaching the younger child or sometimes even what I am teaching the older siblings. When his older brothers were learning about the Revolutionary War, my youngest got to play with plastic soldiers at his learning center during our read alouds. Always during preschool/kindergarten years, I include dress up clothes for community workers. I hope these ideas will help you incorporate learning centers into your homeschool. It’s a great way to keep the younger ones learning and busy. What have you included in your learning centers?